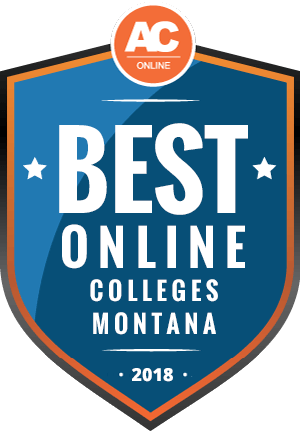 Why Choose Montana for Online Higher Education? Lumina Foundation projects that by 2020, 69% of Montana professions will require college experience. Employment projections for certain fields reinforce the importance a college education in Montana. For instance, more than half of projected finance positions in the state opening between 2015 and 2025 will go require at least a bachelor’s. Seven Montana schools ranked among U.S. News and World Report’s top 100 regional universities in the west. Two schools ranked among the top national universities: the University of Montana and Montana State University. These distinctions prove students can obtain valuable online degrees in Montana. When choosing schools, consider cost, program availability, transfer policies, and admission deadlines. Check with schools for specific information and explore financial aid through the Federal Student Aid website. The Integrated Postsecondary Education Data System (IPEDS) reports that Montana schools offer 24 programs completely online, with thousands of undergraduate, graduate, and international learners studying online. Candidates in these online programs include single parents and full-time employees who do not have time to attend in-person classes, along with professionals looking to retrain, and those living in underserved areas. Online learning allows students to pursue an education when they cannot come to campus, due to time or travel restraints. Cost represents one of the most important factors when choosing a college. Learners should bear in mind that in-state students typically pay less in tuition than out-of-state candidates, and private schools often charge higher tuition than public ones. Students attending online programs in Montana from neighboring states may qualify for lower tuition due to reciprocity agreements. Institutions may also provide separate tuition rates for online learners. Degree seekers should check each school’s tuition rates. The following chart addresses some of these tuition details. The National Center for Education Statistics (NCES) reports that U.S. students at public, four-year schools paid, on average, $19,204 in resident tuition and fees for 2015-2016. Montana learners paid significantly less, with average costs of $14,862. Tuition varies by institution, but private schools often charge more than public schools, and community colleges frequently charge less than four-year institutions; however, the best way to determine tuition is by looking at specific schools. IPEDS reports most out-of-state students studied online exclusively through Montana schools in 2016. Out-of-state candidates should consider reciprocity agreements between states since these relationships can lower costs for nonresidents. Learners should also consider attendance requirements for distance education. Some online programs in Montana require degree seekers to visit campus for orientation or other components. Students should ask their advisers for information regarding these details. Montana is a member of the Western Interstate Commission for Higher Education (WICHE) with 14 other states: Alaska, Nevada, New Mexico, Oregon, Hawaii, Arizona, Colorado, California, Idaho, Wyoming, Washington, Utah, North Dakota, and South Dakota. The commission’s Student Exchange Programs allow out-of-state candidates to pursue cheaper online degrees in Montana or other WICHE states. The program includes the Western Undergraduate Exchange, where nonresidents pay no more than 150% of resident tuition; the Western Regional Graduate Program, where nonresidents pay resident tuition; and the Professional Student Exchange Program, where out-of-state students pay lower tuition rates. The National Council for State Authorization Reciprocity Agreements (NC-SARA) assists distance learners by encouraging common standards among participating institutions. The council also provides the structure for reciprocity agreements that lower the cost of nonresident education. Specific Montana schools in this agreement include Dawson Community College, the University of Montana, Apollos University, and Miles Community College. All involved schools must hold accreditation and abide by the Interregional Guidelines for the Evaluation of Distance Education. The best online universities in Montana provide a wide variety of programs at affordable prices and boast high student retention rates and percentages of graduates who earn employment. Expert faculty and available concentrations may also impact a school’s value. The institutions on this list boast enough of these qualities to rank among the best online schools in Montana. Candidates searching for valuable online programs in Montana should consider cost, admission requirements, transfer policies, and semester format. The following questions and answers offer guidance on these topics, but learners should check with their schools for specific information. Do online credits cost more or less in Montana? According to the Educational Resources Information Center (ERIC), many schools charge higher tuition for online learning than on-campus coursework. For example, ERIC reports that most schools in the Minnesota State College and University system charge an average of 19% more for online classes. Resident students at Montana State University Northern who study online pay $312.78 per credit, whereas on-campus, in-state students pay $289.27 per credit. For a 12-credit semester, online learners pay approximately $300 more in tuition and fees. Students earning online degrees in Montana may pay fees related to distance learning. For instance, Montana State University – Bozeman charges online learners a computer fee and a distributed learning fee for a total of $48.65 per credit, beyond tuition. However, costs vary by institution, so students looking for affordable online colleges in Montana should explore their school’s tuition and fee schedules to determine exact rates. Which Montana schools accept the most transfer credits? The Montana University System (MUS) uses a common-course numbering policy. This process allows for easier credit transfers. MUS also provides standard general education guidelines that allow learners at tribal, community, and public schools to transfer 30 credits of natural science, humanities/fine arts, communication, social sciences/history, cultural diversity, and mathematics classes. Furthermore, earning a MUS associate degree fulfills general education requirements for transferring students. MUS also provides dual enrollment opportunities for students who are exploring top online programs in Montana. Dual enrollment options involve health sciences, education, and business. Participating schools include Dawson Community College, Montana State University Northern, and Helena College University of Montana. Online universities in Montana may have their own standards for transferable coursework, such as a minimum grade or a time limit. For instance, Carroll College accepts transfer credits from the last 15 years if the student obtained a C-, but insists students complete half of program courses at the college. Carroll College accepts as many as 62 lower-level semester credits. The University of Montana considers all previously completed coursework for transfers. Degree seekers should note that classes with no course equivalents may transfer as electives only. For example, a previously taken Shakespeare class may become an elective if the new school does not offer its own Shakespeare course. Will any online colleges in Montana accept a GED? The best online schools in Montana accept candidates who pass the General Education Development (GED) test or the High School Equivalency Test (HiSET). This acceptance allows degree seekers who did not graduate from high school and learners who earned homeschool diplomas to attend college. For instance, Montana State University Billings accepts GED and HiSET scores from incoming freshmen and encourages homeschool candidates to speak with admissions experts to determine which educational path to take. Some schools place regulations on GED/HiSET candidates. As an example, Montana State University Northern accepts GED applicants without stipulation, provided they are over 21. Applicants under 21 with this credential, however, may only gain admission as conditional freshmen. Furthermore, the university will not accept test scores before an applicant’s high school class graduates. Acceptable scores may vary by institution, so GED/HiSET recipients who are searching for valuable online programs in Montana should consult admissions departments for specific information. How many academic terms per year do online colleges in Montana offer? Many schools operate on standard semesters, with the majority of learning occurring during the spring and fall. Some online programs in Montana do not follow this format. In particular, the University of Montana Western allows students to complete courses on a block schedule. The school calls this process Experience One, or X1. For X1, candidates take classes, one by one, and each class lasts 18 days. This method leads to monthly start dates since each class concludes in less than a month. This process allows students to finish more courses in a year since five classes can fit within the 16-week semester time frame. Candidates should note, though, that most online schools in Montana deliver courses through standard spring, fall, and summer formats. Which online colleges in Montana will accept the FAFSA? According to the NCES, about 85% of full-time freshmen at four-year schools received financial aid in 2015-2016. To qualify for federal aid, students submit the Free Application for Federal Student Aid (FAFSA). For 2015-2016, learners who submitted the FAFSA earned a total of $28.2 billion through Pell Grants, federal loans, and work-study opportunities. Non-government providers of aid may also insist applicants submit the FAFSA. The U.S. Department of Education’s Federal Student Aid section labels public schools as institutions that use government funding. For this reason, candidates can assume that all public colleges and universities in Montana accept the FAFSA. However, private schools may refuse federal funding in favor of operating more independently from government regulations. Degree seekers should check with financial aid departments of private schools to determine if they accept federal aid. Are there any free online classes I can take from Montana colleges? Colleges and universities may offer free classes for certain groups of students, such as candidates over 60. Schools may also permit learners to try sample courses to see if online learning fits their needs before they commit to a degree. Students at the University of Montana can also participate in free online training through the Geriatric Workforce Enhancement Program. This training covers Alzheimer’s Disease through two courses: cognitive decline and dementia in older adults, and screening for cognitive impairment. Candidates in healthcare professions can use these opportunities to fulfill continuing education (CE) requirements for licenses. Montana residents can also explore free courses through the Billings Public Library. The organization offers candidates with a library card access to more than 500 courses, some of which may qualify for CE needs. These courses cover topics such as fitness, arts, technology, history, pet care, and culinary arts. The Billings Public Library also provides free tutorials in computer maintenance, crafting, boating, and citation formats. Students interested in these free opportunities should consult their schools for options. How can I find the online program options at Montana colleges? Candidates interested in accredited online schools in Montana can use MUS’s website for guidance. This resource provides a list of schools that are included in the University of Montana and Montana State University groupings, along with community colleges and tribal schools from the state. Site viewers can click on an institution to view information such as school location, phone number, offered degree levels, and URLs. MUS also offers a program search tool where degree seekers can search for any combination of program, degree/certificate type, and Montana institution. The site also provides news on Montana education, information on the Board of Regents’ meeting schedule, quick links to schools’ tuition rates, and details on enrollment. Students can fill out the FAFSA to apply for several forms of financial aid, including Pell Grants and scholarships that do not need to be repaid. These scholarships may come from schools or private organizations, based on students’ financial need, academic merit, professional accomplishments, personal history, and location. For instance, Montana learners can apply for the following funds. This scholarship assists non-freshmen Montana residents while they pursue degrees in fields such as agriculture education, landscape design, floriculture, environmental conservation, and wildlife science. Applicants should intend to work in gardening, horticulture, floral design, or a related profession. Candidates must submit applications with transcripts, recommendation letters, and information on personal goals and accomplishments before February 1. Medical students studying osteopathy qualify, but should intend to work in Montana, Washington, Oregon, Idaho, and Alaska. The organization gives preference to candidates in these states. Applicants must submit essays through written posts and videos and provide three recommendation letters. Undergraduate females from any Montana Indian Reservation may qualify. Applicants must have a 2.5 GPA and full-time status. Recipients may study at schools such as the University of Montana Western, Helena College University of Montana, and Montana Tech. Application requirements include short essays on personal strengths and influential moments. High school seniors in Montana may apply for this scholarship, provided they dealt with hardship of some kind. Financial need and academic accomplishments also impact applicants’ chances. Candidates must submit applications electronically by March 15 and may use the funding at several online schools in Montana, including the University of Montana and Montana State University. Montana and Colorado residents who survived cancer as children should apply. However, applicants must provide evidence of acceptance into a college or university. The foundation uses GPA, ACT/SAT test scores, and application responses to determine recipients. Candidates must submit applications by March 15.